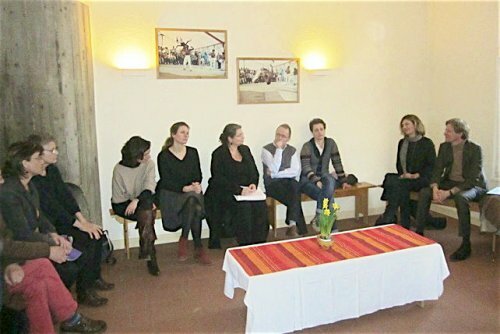 On Friday 11 March, the Director and the Head of the Legal Affairs Division of the French National Office for the Protection of Refugees and Stateless Persons (OFPRA) were in Taizé. They made the journey from Paris for the day in order to visit the refugees currently being welcomed here and in order to see for themselves the impressive groundswell of solidarity created in the local area. Bravo et merci à la Communauté et aux habitants de @taize_fr pour l'accueil de réfugiés et de demandeurs d'#asile en CAO venus de #Calais. Well done and thank you to the Community and villagers of @taize for welcoming refugees and asylum seekers from Calais. After a short tour of the Taizé, Pascal Brice and Marie Salord met with the young refugees who arrived from Calais during November. The brothers had indicated to the local council that they could accept some refugees, and eleven young people from Sudan and Afghanistan are currently living in Taizé. These young men, all Muslims, live together in a house in the village, close to the Brothers’ house and other houses used to accommodate the young pilgrims who visit the community. They had the opportunity to introduce themselves to the visitors and tell them about what had led them to leave their countries and their families, to recount the journey that had brought them to Taizé. Many of them have lost family in the fighting in Darfur, where some of their close ones are still staying in refugee camps. The Sudanese spent several weeks in Libya, some of them even several months, before attempting to cross the Mediterranean. Their plan was not to come to Europe, but simply to find a safe place to live in peace. Arriving in Calais, they were offered the chance to go to the small village of Taizé. Mr. Brice thanked the young people for their trust in accepting this offer and also for trust they showed in allowing France to process their asylum applications. 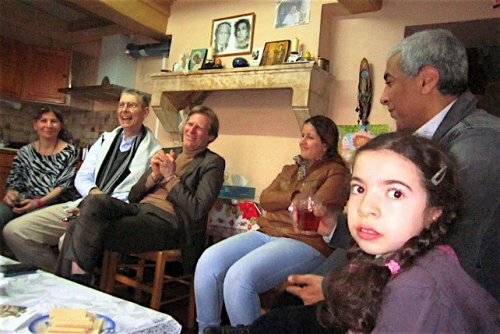 After that meeting, the OFPRA delegation visited two Christian families, refugees from Iraq. One of the families, an Iraqi-Egyptian couple with a little girl of 7 years, has been in Taizé since 2010. The other family, a couple with two boys aged 3 and 6, arrived in France in June last year, coming directly from Erbil, in Iraqi Kurdistan, at the invitation of the community. The local people have been enthusiastic to help welcome the refugees: volunteers come regularly to teach French and to help the children with their homework. Doctors have given free treatment to those who didn’t qualify for health cover and neighbours take them on outings and bike rides ... A meeting with some of volunteers was organised in order to share with the visitors from Paris the and joys and the issues raised through this contact with the refugees. Many of the volunteers expressed their gratitude to the young people and talk about what they had personally received from their presence. But they also expressed their incomprehension at the weight of the red tape involved. The open and frank conversation allowed everyone to take measure of the complexity of certain situations and also of ongoing work research, driven by the government to improve the inevitable defects of the system. Attention to the person and respect for human dignity are the basis of a good welcome of refugees and assylum seekers. 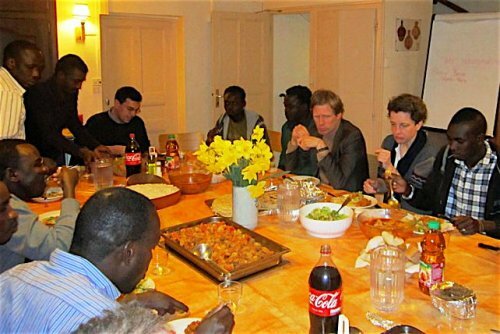 The visit ended with a Sudanese meal lovingly prepared by the young refugees. A photo reportage about the visit can be seen on the website of the local newspaper Journal de Saone-et-Loire. Brother Alois has recently published an article on the issue of refugees in Europe. It was taken up by newpapers across the continent, including The Church Times.